Ho Ho Ho! 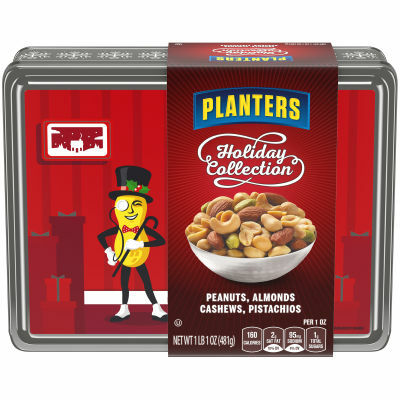 - This festive box of Planters peanuts, almonds, cashews and pistachios is the perfect gift for a friend or loved one this holiday season. Packed in a red box with images of gifts, this Holiday Collection mixture of nuts is as beautiful as it is delicious. - Celebrate What's Important this Holiday Season - These mixed nuts are perfect for the whole family. Gather around your fireplace, play some games, and munch on this mixture to liven up to your holiday. Don’t forget to save some for Santa! Serving size 1 oz (28g/about 34 pieces).